DUI accidents continue to be a problem in Las Vegas, Reno and Nevada as a whole. Stiffer punishments do not seem to deter criminal conduct and every year people die because people get behind the wheel; others are permanently injured. Alcohol is a 24-hour hobby in Nevada, and the risk of driving here is that much greater given all the consumption. If you have been the victim of an accident caused by a drunk driver it is crucial to retain an aggressive attorney that will fight for your rights in getting the compensation you deserve. Benson & Bingham will use the facts of the DUI to push the insurance companies to the limit in resolving your case to avoid a potentially criminal situation for the wrongdoer. If the injuries resulted from a DUI accident are severe, the attorney’s at Benson & Bingham may decide to file a lawsuit immediately rather than try to resolve the case pre litigation. The advantages in doing this are case specific. Should your injuries or the injuries of a loved one be the result of a DUI accident please take a moment to fill out a brief summary of the events on our website or contact us by phone and an experienced attorney will call you back today. Side impact car accidents result in very high trauma injuries. This is because side impacts are usually caused by a party whom runs a stop sign or stoplight; thus, no braking or vehicle slowing occurs. The energy from the speeds of both cars is transferred to the occupants. The dramatic reduction in force when a vehicle is caused to decelerate in an instant causes body parts to mechanically move direction causing tearing, ripping, and jolting of muscle tissues. Resulting neck injuries are very prominent as well as major bone injuries like: fractured ribs, broken pelvis, lumbar spine injuries, fractured legs and arms, and serious head trauma. 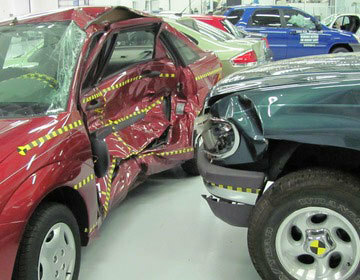 Side impact car accidents often seal doors shut on the impacted vehicle such than extrusion tools are necessary to free the passengers. Modern day side-impact air bags attempt to cushion the blows from side impacts, but the forces are often so great that air bags will not totally help the deceleration forces impacting the body. The area of the intrusion can tell investigators whom may have entered the intersection first and skid marks can also help determine speeds. Modern day vehicle recorders also help police determine exact speeds at time of impact. Injuries from car accidents caused by an angle approach are very telling by the location of such pain. Left sided impacts naturally may have left sided trauma and vice-versa. Often the force of the impact causes the body to move in the opposite direction of the hit. Thus, a right side impact will cause the body to, at first, go right with body extremities going the opposite direction given the forward momentum they had prior to and during the impact. The twisting and turning of the body joints cause major core injuries around the muscular skeletal system. T-bone accidents typically involve two vehicles or more that are traveling a moderate to fast speeds, and the injuries can be deadly. No reaction by either driver is completed given the emergent crash. Thus, we refer to these accidents as the "unexpected" crash scenarios. Failure to yield car accidents are typical in Nevada as Las Vegas subscribes to the green circle light signal requiring drivers to yield to oncoming traffic. Drivers often confuse the green circle with the green arrow thinking green means go. Drivers also will attempt to make a green circle turn thinking they can beat oncoming traffic who might also have a green light. Misjudging speed is a critical mistake and creates a liability mess if independent witnesses were not there to eyeball the accident. Similar to T-bone style accidents failure to yield the right-of-way often have high speeds contributing to the impacts causing severe injuries and death. Contact our personal injury law firm if you have questions about the liability or damages aspects of your Nevada car accident case. Rear end car accidents are some of the most common accidents in Nevada and the #1 contributor to these type of accidents is speed. Speeds are often misjudged resulting in a rear end impact. Given one car is often totally stopped the impacts can be deadly if the speeds are high enough. Distracted driving is also a major cause of rear end accidents as texting, cell phone use, and other attention grabbing issues distract the driver from being careful. Intersections and freeways are major rear-end accidents areas. Car accident attorneys who are used to handling such impacts are aware of the needs of rear end victims as the injuries tend to involve the neck and low back. Seat belt systems keep passengers from being killed, but tethered the body to the seat without much energy absorption. This pressure from being stopped caused lumbar disc disruption and major strain on the tendons, muscles and ligaments that protect the spinal column. Whiplash of the cervical region is also a very common injury that can require months of rehabilitation and treatment. Often the injuries are so severe they are permanent. Multi-car accidents are typically rear end style accidents where car 1 hits car 2, and car 2 hits car 3, and so on. It is not unusual to see 5 car pile-ups that are the fault of one particular car. The laws of physics usually dictate that most damage occurs to the first car and as energy is absorbed, the other cars to a lesser degree, also get impacted. Depending on the distance in between the vehicles energy transfer can occur or be absorbed by any one car in the chain of events. These types of accidents stress the need for under-insurance coverage given that there are multiple parties with a likelihood of minimal insurance coverage; thus, the quandary of little coverage and major damages. The law does not discriminate in who gets the lion's share of the coverage in a multi-car accident. Often these victims share the policy proceeds by way of an equal apportionment or more often, a pro-rata share. When bodily injury and property damages expenses far exceed the policy limits of the at-fault party, the insurance proceeds are interplead with the Courts to decide how the monies should be split if all parties can't agree on a fair share. This can be complicated when one of the parties is not represented by counsel as they may not understand the process causing unnecessary delay and typically more costs as it forces some of the parties to file lawsuits unnecessarily. Head on collision car accidents involve front end to front end impacts with the most severe consequences. The inertia of energy created by head on collisions is devastating and often result in death, occupant ejection, and/or catastrophic injuries. Head on collisions are common on two-way roadways where separation of lanes is minimal and lane crossing is easy to occur. Drunk driving, sleep deprivation, and distracted driving are just a few of the causes of head on collisions. Freeway head-to-head collisions usually involve speeds up to 80 mph in both directions causing a delta V (or change in direction) of massive energy. Thus the impact energy is equal to 160 mph of force. Occupants in such car accidents are lucky to survive. Frontal airbags may avoid facial injuries, but he sudden deceleration is so severe that internal organs including the brain and spinal column often do not stay intact. Brain shearing injuries, spinal cord disruption, and major organ bleeding can occur. Side swipe car accidents occur when a driver may overreact or actually take action to avoid a full blown T-bone accident. Side swipe accidents also occur when drivers make lane changes not seeing the vehicle in the next lane. Commonly known as "blind spot" accidents damage to the vehicles occur on the side doors and quarter panels of the car. The intrusive damage is not as sever as other styles of car accidents, but the impacts can still be great the to occupant shoulders and necks as the jerking mechanism of the impact is unexpected and can be severe. Insurance companies often balk at injuries sustained in side swipe accidents because they can argue that the impact forces are not as severe as say a T-bone or intersection collision type accident. Our team of biomechanical experts will investigate, research and analyze the impact to causally link the accident to the injuries complained of. Car accident attorneys must understand the physics of the accident to understand what arguments the opposing side will make. The personal injury lawyers of Benson & Bingham understand the vehicle dynamics of sideswipe car accidents and have handled thousands of vehicle accident cases. Angled car accidents simply mean a vectored line accident whereby a vehicle for some purpose makes a direct line approaching and impacting another vehicle a 5 to 45 degree angle causing an impact. Angled car accidents are hard to distinguish from T-bone accidents or other style impacts, but may be caused by major lane crossing, blown red lights, and ricochet accidents or secondary impacts. 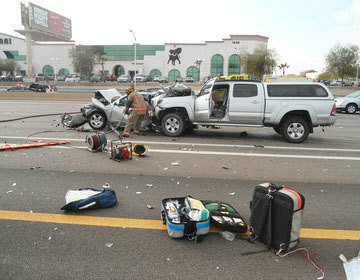 The speeds and forces of such impacts are similar to distracted driving and other no reaction accidents. Fatal Car accident attorneys are a special and seasoned breed of lawyers who are familiar with the laws of Nevada and understand the requirements of when to set up an estate and when not to. Natural living heirs are the Plaintiffs in a wrongful death action along with the administrator of the estate. The estate is only entitled to punitive damages, medical expenses, and funeral expenses. Our law firm will represent the estate and the individual heirs in a wrongful death lawsuit. Sometimes in may not be prudent to open an estate if medical expenses were limited and reckless or intentional conduct was not involved (thus the prayer for punitive damages may not be available). Opening an estate is a very good idea if the medical expenses accumulated prior to the death of the decedent were high. 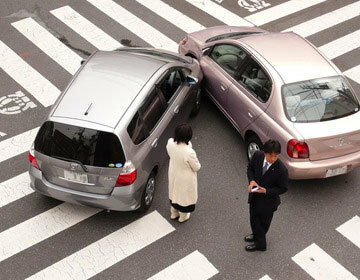 Fender bender car accidents are impacts that are usually not jaw dropping or have much property damage. Fender bender car accidents may present whiplash injuries and may have more damage present under the bumper. Car accident mechanics and insurance estimators may pull off the bumper of those cars to check the integrity of the bumper cushion, and inspect for frame damage even if the vehicle skin appears to be of "minor damage." Most car insurance claims representatives will offer fair settlements on damages that exceed $1,000.00 on bumper or other property damage. This threshold is a line in the sand that may direct the claim to a "low impact" review and low initial personal injury monetary offer. Private property car accidents may or may not be investigated by the local police agency, LVMPD or other department given the accident may not be covered by local or state statutes. Private property accidents are still covered under common law or Nevada case law for negligence. Excessive speed in a parking lots is a common cause of accidents as parties often are in a hurry or may think the travel lane is not speed restricted given the lack of speed limit signs. Failure to yield to oncoming traffic or failing to recognize a vehicle who may be reversing out in a cautious manner cause injury accidents. If the police have not been summoned or refuse to entertain the accident, it is a prudent idea to file your own police report with the local police station. It is also imperative to get the license plate # and exchange personal information including insurance information. For mor informaiton, please visit: Property Damage and Auto Accidents. Commercial car accidents may involve everything from taxicabs, limousines, buses, utility trucks and business vehicles. Much of that content is covered within our website under those subject headings. Commercial accidents usually involve higher insurance limits, which is beneficial for those who sustain major injuries. Commercial vehicles are special circumstances as those drivers usually need a commercial drivers license (CDL) to operate and may be violating a commercial DOT or other driving rule. Commercial vehicles also have special features that are not always revealed to opposing sides. Such features include video footage, computer monitoring of the vehicle that captures speed, location, and other factual details. Rollover car accidents are often caused by driver error or products liability (tire failure). Falling asleep is a very common cause of rollover accidents. Drivers may fall asleep and wake up as they are going off road, and in an knee jerk re-action they may pull the steering wheel overcorrecting and causing the vehicle to begin a rollover event. That rollover event can be deadly. The Driver's insurance policy will be liable for payment to the passengers, but often the policy is deficient to provide adequate coverage to those involved. Seat belt failure should be looked at as well as structural stability of the occupant cage as possible other avenues of legal liability. Preservation of the vehicle and its contents is an important evidentiary concern. Yaw marks, paint marks and scratches, can be very telling information on speed, number of rolls in the rollover sequence, vehicle velocity, and occupant direction. We specialize in investigating rollover car accidents. Placing aside the definitions above, we all know aggressive driving when we see it first hand. That "other driver" who appears to be impatient or anxious and is taking risks that we immediately recognize as dangerous and having potential to cause an accident. Many reported cases of aggressive driving are the result of an individuals financial, emotional, and/or personal relationship issues. There is an important distinction between aggressive driving and road rage. Road rage is considered an intentional act wherein the driver is using his vehicle as a weapon or perhaps giving chase to another vehicle. Road rage is an intentional criminal act. Due to the intentional nature of the drivers' conduct, insurance companies will not cover road rage acts. Insurance coverage is designed and contracted to cover negligent acts, such as aggressive driving which lacks the actual "intent" to use a vehicle as a weapon. Irrespective, where does that leave an injured victim who was in the path of an aggressive driver? Aggressive driving usually leads to aggressive injuries including spinal displacement injuries such as a disc bulge or protrusion, neck and back sprain or strain injuries, head or traumatic brain injuries and or death. At Benson & Bingham, we can assist you in putting the insurance companies on notice in opening a claim with the aggressive drivers insurance carrier. Do not let them mitigate or downplay their aggressive driving behavior. Aggressive drivers often attempt to deny or alter what actually caused the accident after leaving the accident scene. We work closely with investigators and when necessary we deploy investigators and engineers to the scene of an accident to survey the area and roadway, gather critical physical evidence such as skid marks, debris and roadway indentions as well as gathering witness information and eyewitness statements. The fact gathering process is critical in preserving the evidence in your case. Our firm has successfully handled tens of thousands of car accident claims. Let our team of compassionate and experienced lawyers walk you through securing the evidence in your claim and protect your rights under Nevada law. Example of a Failing to Yield Accident. Example of a Rear End Accident. 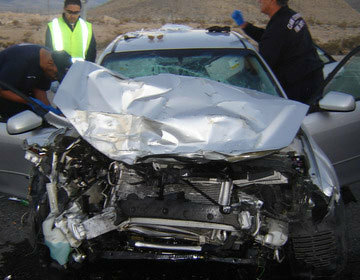 Example of a Head on Collision Accident.